Whether it be revamping that little black dress or modernizing an old casual jean outfit, glitter pumps are the perfect accessory that can make any dull outfit pop. 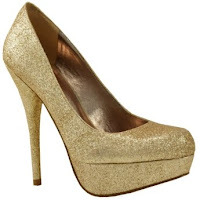 Metallic is the new neutral and glitter pumps are a great metallic accessory that can be paired with a range of outfits. When choosing an outfit, pay attention to fit and definitely avoid over-the top patterns. Both can be the slight difference between making an outfit look fashion forward or simply trashy. Wear them with a minimally-structured plain black or white mini dress. For day time, allow the dress fabric to be loose-fitting. Whereas for a night out, dare to go for something a little more form-hugging. If you prefer separates, pair them with a simple top and some sleek skinny jeans. Make sure to not over accessorize when wearing glitter pumps. Use this shoe as the main fabulous accessory, making it the focus of your outfit as you would with big bold jewelry, like a statement necklace or a cocktail ring. Opt for a set of thin bangle bracelets and or a small single charm chain necklace for sweet and simple touch. Where can you find these fabulous pumps? Not to worry, there are numerous brand options within all price ranges. Christian Louboutin offers these shoes in a wide range of colors, including gold, sliver, black and even pink. They go for around $690 a pair. Steve Madden has a similar shoe called the Caryssag Pump. The colors available are gold, black and multicolor. It sells for $129.95. Bakers has a more affordable option. 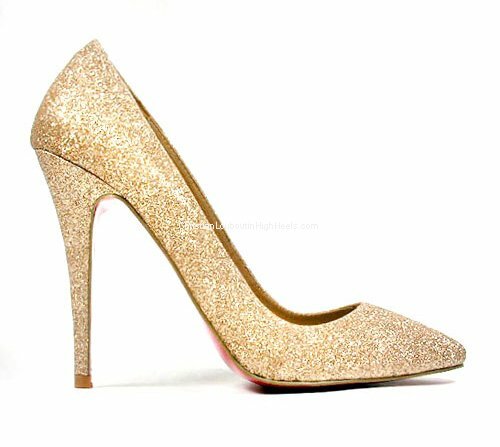 They carry the Victoria G Dress Pump that comes in gold, silver and multicolor. This shoe is priced at $79.95. Take your pick ladies. Just remember, always strut them with class!